Why is our Silver Package a deal you can’t miss? Value. The many benefits we offer would cost you twice as much at most other fishing resorts and lodges! Experience. 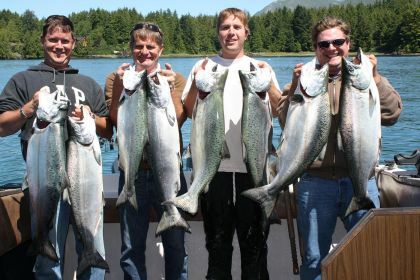 With us, you’ll get a fisherman that has spent many hours on the water guiding with great success. World Class Fishing. 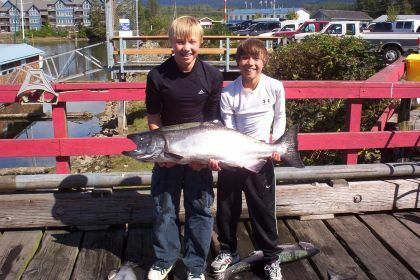 There are three top areas to fish on the coast and ours can be considered the best of the best! We have long been known for getting coolers full of salmon. Many fishing resorts try to sell you on the “middle of nowhere” approach, but that doesn’t guarantee you good fishing. We have incredible scenery as well as great fishing – just check out some of our stunning photos! Less Wind. This area is not subject to high winds, unlike many other fishing destinations on the coast! You don’t want to be blown off the water on your holiday. Comfort. For the Silver package we put you in a 27 ft covered boats, with decks larger than any other in their size range. Most lodges use 17-19ft boats and if you want a larger boat you pay a large “upgrade charge”. Accommodation in a house, cabin suite, or B&B. Book early to ensure an ocean view! Vacuum Packing and cleaning of your catch. The cost of vacuum packing is included. Vacuum packing makes transporting your fish much simpler, and it preserves the fresh taste of your catch even at home. We use professional grade vacuum bags and proper washing techniques to ensure that your fish arrive in the best possible condition. All your fish are taken care of for you. All you need to do is pick them up at the end of your trip. Guided fishing on one of our 27 foot boats. All necessary gear is included, and our covered boats will keep you dry and warm. Our fishing equipment is top of the line and includes Scotty downriggers and 10.5 ft Shimano rods and reels. All our boats have toilets.